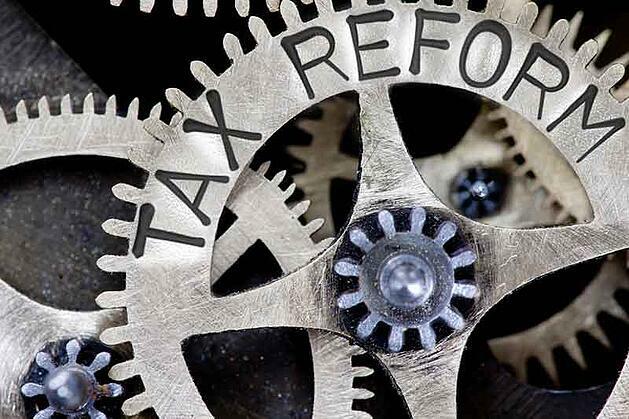 Part 2 in the Realized Series "2017 Tax Reform Impact on Real Estate"
It’s no secret that President Donald Trump and the Republican-controlled Congress have made tax reform a huge item on their agendas. Though the rhetoric is plentiful, what has been released so far is a one-page reform proposal from the Trump Administration, and the House of Representative’s tax reform proposal, A Better Way Forward on Tax Reform which was issued in 2016. The basics of Trump’s tax reform plan are to simplify the tax code, cut taxes on middle-income families and businesses, and get rid of tax breaks for special interests. Meanwhile, the House GOP plan proposes sweeping corporate tax reforms. One such reform would replace the current corporate income tax with a destination-based cash-flow (DBCF) tax at 20% for corporations and 25% for pass-through entities like Limited Liability Companies and Limited Partnerships. Additionally, the House tax reform plan would reduce taxes on investment income, such as dividends and capital gains, but also eliminate business tax deductions for depreciation and interest expense. Right now, the impact of tax reform on real estate is difficult to predict. However, in this overview, we’ll attempt to shed some light on what might be the end result of tax reform 2017. Setting aside politics, let’s be clear, the US tax code needs to be overhauled. The last major changes to “the Code” occurred 30 years ago with the Tax Reform Act of 1986. The current tax code is bloated and uncompetitive, from an international point of view. According to the Kyle Pomerleau at the Tax Foundation, the marginal income tax rate for US corporations is third highest in the world. The Tax Foundation estimates that in 2016 individuals spent 8.9 billion hours completing their tax returns last year. To put this in perspective, last year the total cost of complying with with Internal Revenue Code (IRC) was estimated $409 billion! So yes. The current tax code is in desperate need of reform. A major part of the GOP plan is what’s known as Destination-Based Cash-Flow Tax (DBCFT). Here’s how it works. Under the current tax code, corporations are taxed on profits (revenue less expenses) at a marginal rate of 35%. When businesses invest in long-lived assets like factories and equipment, they are only required to write off, or depreciate the cost of of these capital expenditures over the theoretical life of the asset (as determined by the IRS). This depreciation expense reduces profits and the taxes of businesses in subsequent years. Under DBCF, businesses would be able to fully write off, or expense capital investments in the year in which those investments are purchased, rather than depreciating them over time. This “immediate expensing” means that if a business acquires a building, it can deduct the cost of the capital investment in the year in which it was purchased. To the extent that this write off exceeds the revenue of the business in the first year, the business will have a tax loss carry forward that they use to reduce tax liabilities in subsequent years. Sounds good, right? Well, maybe. To make up for the loss in tax revenue from immediate expensing, another provision of both the Trump Tax Plan and House Tax Plan calls for no longer allowing businesses to deduct interest paid on debt. Presumably this includes the interest paid on mortgages. Since real estate capital expenditures tend to rely on mortgages, the proposed changes would force businesses to carefully weigh the after-tax tradeoff of using debt. Most economists agree that reducing corporate tax rate on profits to 15%, as proposed by President Trump’s framework, would have a positive near term effect on the US economy. To replace the decrease in tax revenue from lower corporate tax rates, the GOP’s tax reform plans call for a new 20% to 25% tax on pass-through ownership structures, such as partnerships and LLCs. While this sounds problematic for real estate investors and small businesses that tend to use pass-throughs, there may be a silver lining. If the income from pass-throughs is not subject to double taxation at both the entity and individual levels, business owners would benefit to the extent that the marginal tax rate on their business was less than their personal rate. Under both the Trump and GOP plans, tax reform in 2017 poses some huge question marks for real estate investors. Eliminating net-interest deductions in financing tangible and intangible capital expenditures could negatively impact more heavily leveraged companies. Getting rid of the mortgage interest deduction for businesses could dramatically change the debt-to-equity ratio on real estate. Immediate expensing of capital expenditure, particularly real estate, could lead to the mass syndication of individual tax shelters, similar to that of the 1980s. This would likely be good for real estate in the near-term, but create an economic imbalance long-term with investors focus on tax benefits rather than the cash flow properties produce. There isn’t much discussion, as yet, about tax treatment of historical capital expenditures. The concept of depreciating capital expenditures over time has been part of the Code for nearly a century. At this point, there has been very little discussion on the divisions between a cash-flow treatment of business income, and a regular income-tax approach to investment earnings and capital gains. The possibility of eliminating long-standing practices for deferring taxes through like-kind real estate exchanges (i.e., 1031 exchanges) could slow real estate investment velocity, especially among smaller investors. One of our goals at Realized is to help investors make informed investment decisions. We feel that tax reform is the single most important issue facing real estate investors today because real estate investments are always driven, to some degree, by tax policy. At this point, we have limited information but are watching the tax reform debate very closely. For this reason, over the coming months, a large portion of the articles on this website will focus on the 2017 Tax Reform Impact on Real Estate and how this could impact you, as an investor. Stay tuned. If you have any questions or concerns regarding tax reform's impact on real estate investing, please feel free to contact us at Realized1031.com.